Stomach, Glandular stomach - Pigment in female B6C3F1 mouse from a chronic study. 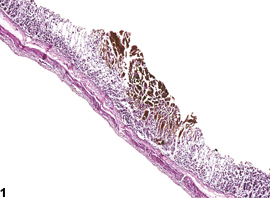 Pigment (likely hemosiderin) is present within a necrotic area of the mucosa. 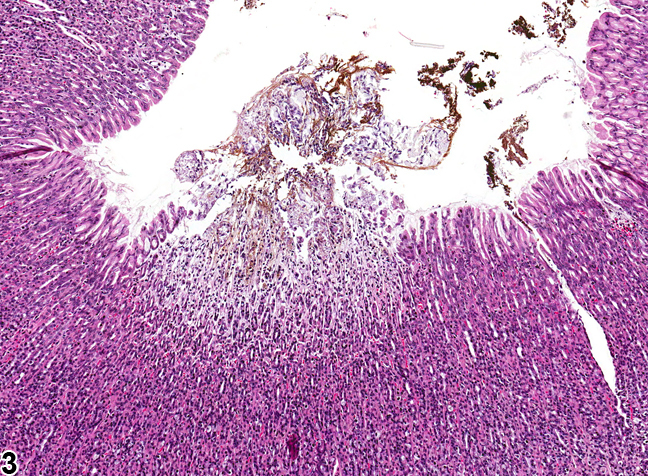 Stomach, Glandular stomach - Pigment in female B6C3F1 mouse from a chronic study (higher magnification of Figure 1). 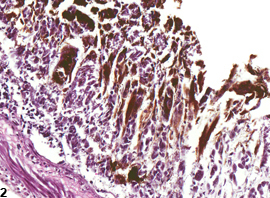 Pigment (likely hemosiderin) is present within a necrotic area of the mucosa. 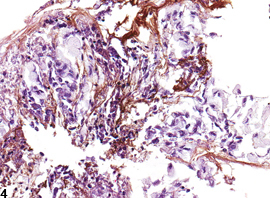 Stomach, Glandular stomach - Pigment in female F344/N rat from a chronic study. Pigment is present within a necrotic area of the mucosa. 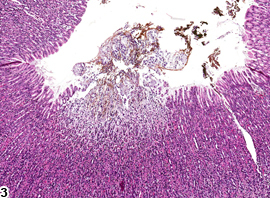 Stomach, Glandular stomach - Pigment in female F344/N rat from a chronic study (higher magnification of Figure 1). Pigment is present within a necrotic area of the mucosa. 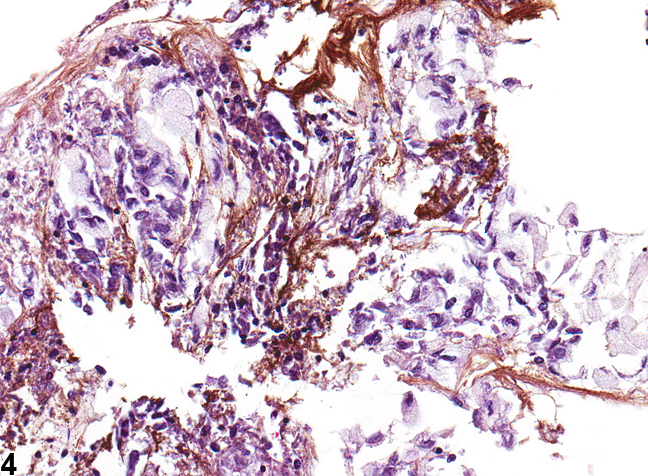 Stomach, Glandular stomach - Pigment in female F344/N rat from a chronic study. 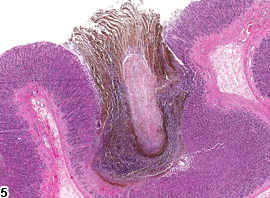 Pigment (likely hemosiderin) is present within the mucosa. Stomach, Glandular stomach - Pigment in female F344/N rat from a chronic study (higher magnification of Figure 1). Pigment (likely hemosiderin) is present within the mucosa. Focal to multifocal areas of pigment accumulation in epithelial cells of the glandular mucosa are occasionally noted ( Figure 1 , Figure 2 , Figure 3 , Figure 4 , Figure 5 and Figure 6 ). In some cases the occurrence is sporadic and of unknown origin and is considered incidental or artifactual. Examples of pigmented material are breakdown products of hemoglobin (hematin, hematin-like, parasite hematin, hemosiderin), lipofuscin, and test article. 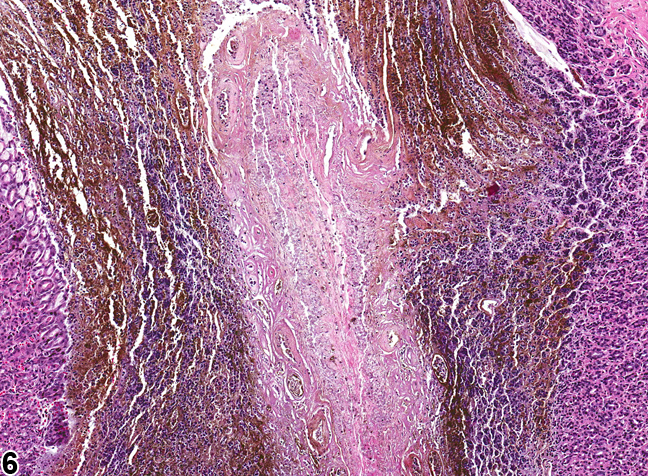 Hemosiderin (golden-brown pigment), often within macrophages, is the most common. The presence of acid hematin-like pigment in the mucosa is suggestive of an ulcerative or erosive process not in the plane of histologic section. Whenever present, this change should be diagnosed as "pigment" and graded. Severity grading depends on the number and size of pigmented areas present and on the density of pigment accumulation. 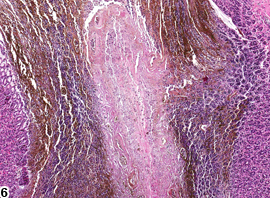 The specific type of pigmented material should not be specified in the diagnosis unless special stains or other means are used for definitive diagnosis. However, in the narrative the pathologist may provide an opinion as to the type of pigment that is present. Myers RK, McGavin MD. 2007. Cellular and tissue responses to injury. In: Pathologic Basis of Veterinary Disease, 4th ed (McGavin MD, Zachary JF, eds). Mosby, St Louis, MO, 3-62. National Toxicology Program. 1992. NTP TR-409. Toxicology and Carcinogenesis Studies of Quercetin (CAS No. 117-39-5) in F344/N Rats (Feed Studies). NTP, Research Triangle Park, NC. Pizzolato P. 1976. Formalin pigment (acid hematin) and related pigments. Am J Med Technol 42:436-440.